A parliamentary inquiry into food labelling has been accused of targeting the Muslim community and sparked warnings that curbing halal certification could threaten Australia’s lucrative food export industry. The inquiry was launched last month following several campaigns on social media and calls by some MPs to restrict or ban halal certification. Some consumers believe certification fees are added to food prices. There are also claims that the money paid to certifiers is used to finance terrorists. But the calls have been opposed by food suppliers, who say the certification system is relatively inexpensive and argue that curbs or bans on halal certifiers in Australia could hurt the food export sector, which is worth about A$40 billion (S$41.5 billion) a year. The Australian Food and Grocery Council said halal certification is vital for Australian suppliers and urged the inquiry to at least help combat some of the “outrageous claims” made by anti-halal campaigners. “At a practical level, halal certification for many food companies is simply a requirement for them to export into countries like Indonesia or Malaysia, or to market their products to people of the Muslim faith here in Australia,” the council’s head, Mr Gary Dawson, told ABC News. Muslim nations have been among the biggest markets for Australia’s food exporters. Indonesia was the third-biggest market for Australian food in 2013 after Japan and China. Malaysia, Saudi Arabia and the United Arab Emirates were also among the top 10 buyers. Australian Prime Minister Tony Abbott has made it clear he does not support moves to restrict halal food supplies. Agriculture Minister Barnaby Joyce, who is from the rural- based National Party, has warned that “if we didn’t have the halal market in beef, that could really affect thousands of meat workers in Australia”. 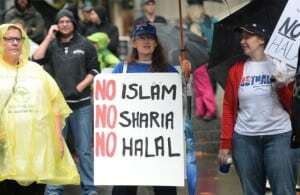 Unlike anti-halal calls in Europe that have focused on slaughtering methods and their impact on animals, the latest Australian push has largely been led by vocal anti-Muslim campaigners. Some allege that the money paid to certifiers has been used to finance terrorists – a claim dismissed by the Australian security agencies. “The Australian Crime Commission is not aware of any direct links between the legitimate halal certification industry and money laundering or the financing of terrorist groups,” its commissioner Chris Dawson said late last year. The inquiry focuses on not just halal food labelling but also certification of kosher, organic and genetically modified food. It is looking at whether certification leads to extra costs for consumers and whether there is adequate labelling to inform buyers that the food has been put through a certification process. Some analysts say such an examination could be useful because the food certification process in Australia is complex and often not transparent to the consumer. The Australian Federation of Islamic Councils, a Muslim representative organisation and a halal certifier, told The Straits Times it does not plan to make a submission or comment publicly on the inquiry. It is understood that the council has concluded it does not want to fuel the already heated debate on halal food. Several European countries such as Sweden, Denmark and Norway have banned halal and kosher meat which involves slaughtering animals that have not been stunned. The campaign against “ritual” slaughter has been led by animal rights activists, including outspoken French actress Brigitte Bardot, who has described halal and kosher practices as being from the “Middle Ages”. In Australia, most halal-certified abattoirs stun animals with a reversible stunning method. Controversially, the previous Labor government suspended live cattle exports to Indonesia in 2011 after reports emerged about cruel practices in some abattoirs there. The inquiry is due to complete its report by end-November.